"Watch your back, Caesar! This salad could be the next national favorite and was inspired by a salad I had at a seafood restaurant in Healdsburg, CA. 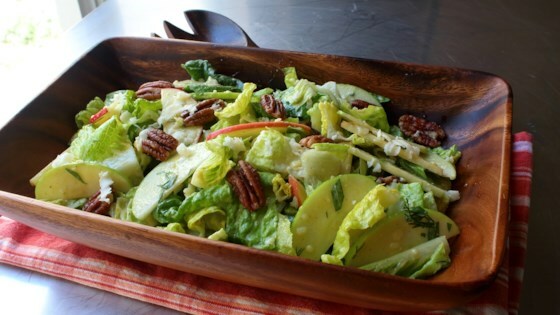 With apple slices, romaine lettuce, Cheddar cheese, fresh herbs, toasted pecans, and Dijon vinaigrette, it's amazing." Place Dijon mustard, vegetable oil, seasoned rice vinegar, Worcestershire sauce, pepper, and cayenne into a bowl. Whisk thoroughly until well blended, about a minute. Transfer to an easy-to-pour container. Place pecans in a skillet over medium heat. Drizzle with vegetable oil. Cook and stir until pecans smell toasty and have darkened slightly, 1 or 2 minutes. Sprinkle with kosher salt and sugar. Cook and stir another minute; remove from heat. Transfer to a plate to cool. Place romaine pieces into a large bowl. Add apple slices, dill, tarragon, and a handful of pecans, reserving some for garnish. Grate Cheddar lightly onto salad, reserving some for garnish. Drizzle in some dressing and toss. Taste and add more salt or dressing if desired. You make not need all of the dressing. Garnish with a few toasted pecans and some grated Cheddar cheese. Chef John created a salad great enough to replace the Caesar! The dressing should be sharp and acidic, but please adjust to your taste. Delicious and filling, with unique flavors. I made this exactly as shown on the recipe. I will be making it often. I might add a bit more sweetness next time. It’s fairly tart with the vinegar, Dijon and apples... but overall it’s good! I liked the pecans. Yummy. Absolutely delicious and wonderful on those hot summer days.